After a busy week, I decided to resolve the issue of no fabric for the partially finished SWAP blouse It is Vogue 2761, a 2002 OOP pattern for a loose fitting top with front and back tucks gathered at neck and waist. 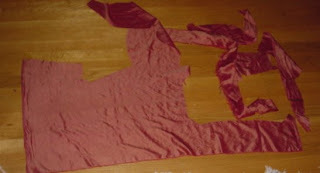 I hung the sleeves, cut out of the "almost the same color", fabric against the blouse and decided I could not use them. I then dug out every scrap of the original fabric I could find and proceeded to figure out how to piece together 2 sleeves. I think I can get 3/4 length sleeves if I splice some pieces in the under arm area. I feel better now that I have made that decision. 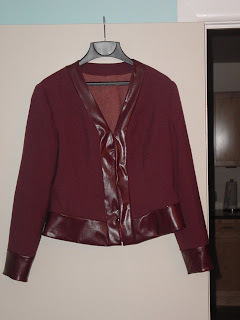 In the past week, which included a 5 day weekend of two carried over 2006 vacation days and 1 holiday, I was able to complete the topstitching on the reversible jacket, a lined skirt and a blouse. The skirt is Vogue 8207, made from a drapy polyester woven, lined with Bemberg. Easy to sew pattern, but hemming the very curved lower edge of the skirt was not fun. I would use a separate bias cut facing to hem the skirt if I were doing it again. 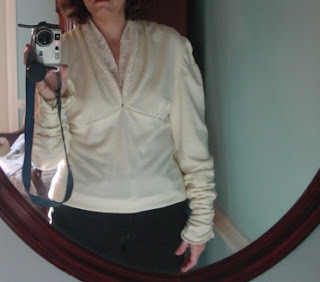 The blouse is Vogue 8118, another easy to sew pattern. It would have been even easier if I had not chosen to make it in a silk print twill which slipped and slid all over the place. Still it went quickly and fits well. The picture is the blouse and skirt on Verite, my packing tape dress form. She is my body double with all my glorious asymmetrical uniqueness. I also cut out and sewed roughly 80% of Vogue 2761, an Issey Miyake blouse, in a gorgeous iridescent rose gold silk dupianni . The fabric was a light weight, inferior quality (slubs, lot of color stripes ) 2 yard piece from JoAnne's, that I bought because the color went well with my SWAP. I threw it in the wash and it crinkled up in a neat texture. That is what made me think of the IM pattern. Problem was the pattern required 3 yards, so I high-tailed it back to the store, on a sale day which I typically avoid like the plague, and bought another two yards of what I swear was the same bolt of fabric. I had cut the front and back of the garment out of the fabric purchased originally. I cut the sleeves out of the newly purchased fabric. After completing all the intricate pleating on the front &back of the blouse, I went to sew the sleeves on. Awk! The color is slightly off. Enough so that my color challenged DH noticed. I love, love how this blouse looked. A round of the fabric and home decorating stores turned up similar colors of the silk fabric, but not the same weight and texture. I am seriously considering starting from scratch using the correct amount of fabric. One completed top has major fitting issues. It is made out of light weight wool knit and lace. It hangs off my shoulders a good 1.5 inches and is large in the bust area. I made my normal size and checked the pattern measurements against my ease preferences. I have found a similiar BWOF top that I plan to use as a comparison. I need to be in the right mood to do alterations and I am not in that mood right now. I love the sleeves and wool makes it very cozy feeling. I am taking a break from the swap this weekend. On Friday night I got a bunch of the new Vogue patterns. I ordered them 10 days ago using the 60% off card in the Vogue Pattern magazine. The patterns just got posted on the web site this past Wed. and the new pattern books still aren't in the local stores. Mail order is the fasted way to get them and they always have my size. Last night after dinner, I cut out the new Issey Miyake jacket in a blue wool. 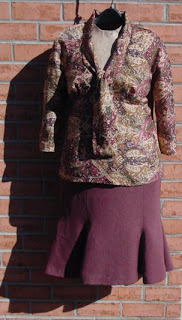 I also cut Vogue 8260 - jacket out of a printed paisley velvet. 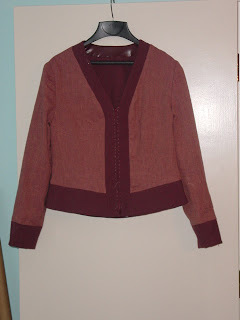 I got the jacket and lining sewed up to the point of attaching the collar before I went to bed. I had expected all kinds of problem sewing velvet, creeping layers, etc. but non occured. Knock on Wood! This is a TNT pattern so it will go together fast. I posted more pictures of my SWAP garments, modeled by Verite and myself, on the Yahoo Photo. See link in list on right. dogs, sewing was a breeze.. The minute the pressure foot hit the plastic side, like at intersections of seams, there was bunching and skipped stitches. 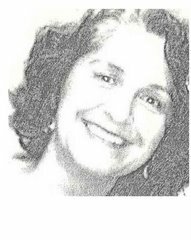 What worked for me was using thin strips of tissue paper between the plastic and the pressure foot. I have major topstitching of the contrast bands looming on the sewing horizon. One side of the band will be the good side of the pleather, the other the good side of the wool. My plan is to put the good side of the pleather on the bottom against the feed dogs and the wool under the pressure foot. I will use the edge stitch foot with the center groove following the seam, and the needle position set at ¼". I will be hand basting the bands together so that they line up and hopefully, fingers crossed, the top stitching will look lovely on both sides of the jacket. I will need to test this as there could be problems with the multiple fabric layers and top stitching with a needle position other than center. Lesson 2. Semi fitted garments, even when made with two layers of thin fabric, have a tighter fit. The problem is not the body, but the sleeves around the bottom of the armhole. The woven herringbone is very soft which I thought would be a benefit when combined with the stiffer wool. I will try tacking the two layers together at strategic seam intersections. Next up, the zipper saga. I have completed 3 bottoms and 4 tops of my SWAP. 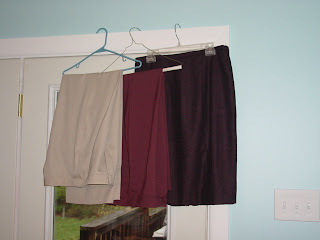 Two pairs of lined pants in stone and red brown gabardine. One pencil skirt in black/burgundy wool blend. 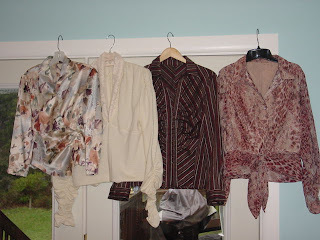 One silk print blouse, one wool knit/lace top, one striped blend blouse, and one poly print chiffon with glitter tie front blouse. There was another rose knit top but it may be a wadder because of a poor fabric/pattern combo. It is aging a bit before a final decision is made. Additional info. on patterns, fabrics and pictures of me wearing the garments will be posted soon. I took a vacation week between Xmas and New Years. All family holiday visits were completed earlier in the month. There were no trips or remodeling projects planned. Bliss. I could sew every day for as long as I wanted. And sew I did. I found that the advice of experienced SWAPpers was very accurate. The preplanning of fabric/pattern combo's facilitated production sewing. Once the current garment was completed to the point that all remained was hand sewing ( done while watching TV), I picked up the pile of fabric, pattern, interfacing, lining for the next garment and started cutting. The thread in the serger and sewing machine was generally in the right color family, reducing thread changes. Tried and true patterns and familiar fabric types really speeded up the process. My one wadder was a last minute change to a new pattern. One thing that really hits home when you sew without interruptions, is the time it actually takes to make a garment. I need to keep this in mind when I buy fabric. If I took the number of garment fabric pieces in my stash and multiplied them by 4+ hours, I would need another lifetime to sew the stash into garments. The jacket and reversible item still remains to be made. But this start puts me in a good position to do some more artistic, creative techniques with the remaining garments. I am actually looking forward to returning to work tomorrow and I have some new outfits to wear.